Nate: But Bart told you your mother died in childbirth! Chuck: He also told me kids wear suits to kindergarten and blue-chip stocks are great for birthday gifts. Serena: Since when do you cook? Nate: Honestly, I didn't even know we had a fridge until this morning. 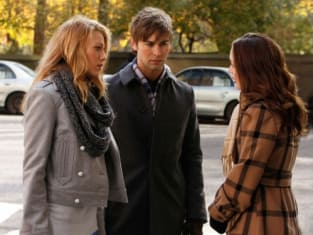 Gossip Girl Round Table: "The Lady Vanished"
Gossip Girl Review: "The Lady Vanished"